about. me. | ed. tech. for. me. Ryan Corcoran recently finished his Masters of Science degree in Educational Technology at Pittsburg State University, after a long seven-year hiatus from being a student. He received a Bachelor of Music degree from Wichita State University, did a year of graduate work toward a Master of Music Education degree at Bowling Green State University in Ohio, then returned to Kansas and completed coursework for a Teaching License from the State of Kansas with a K-12 Music endorsement. After teaching music for a total of five years, Ryan decided to move into the field of Educational Technology. He has been working privately in that field now for five years, and was recently hired on as Educational Technologist at Wichita State University Media Resources Center. 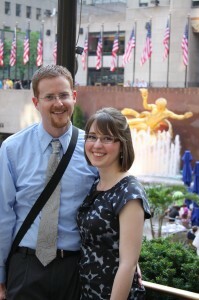 Ryan and his wife, Samantha, have one child together, and are very active in the church. Together, they co-author the website, The Blog Testament (www.blogtestament.com)—currently on hiatus—and Ryan has one published work, Blogging the Bible: Matthew, which was derived from that website. Together, they have gone on one short missionary journey, when they did work with LST (Let’s Start Talking) in Hitachi, Japan. Since then, they have traveled independently to support and encourage missionaries in Scotland and Haruna, Japan.